Potatoes are full of starch, which is a type of complex carbohydrate. 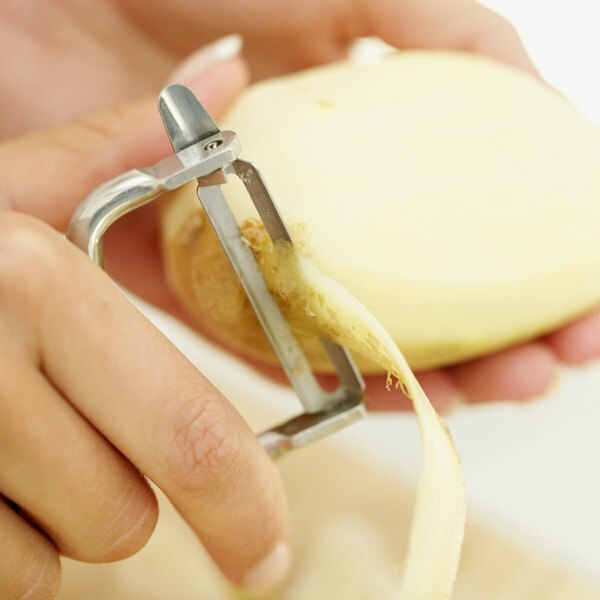 They often get a bad reputation for their high carb content, but the carbs in potatoes are actually a "good" type that take a while for your body to break down. While you need carbohydrates in your diet, going overboard by consuming too much can lead to weight gain. In general, carbohydrates can be categorized as either simple or complex. All types of carbs, except for fiber, eventually deconstruct into simpler forms and absorb as glucose, the primary energy source for all cells throughout your body. Simple carbohydrates, including fruit sugar, or fructose, milk sugar, or lactose, and table sugar, or sucrose, have a straight structure that metabolizes quickly in one simple step in your small intestine. Complex carbohydrates, such as starch, have a complicated branched structure that undergoes two distinct steps before absorption as glucose. First, saliva breaks the complex molecule into a smaller form called maltose. Next, enzymes in your small intestine further break down maltose into simpler molecules so it can absorb as glucose. Fiber is a unique type of complex carbohydrate since it is not broken down into glucose. Instead, fiber stays intact and helps push food through your body. You have a variety of potatoes to choose from, depending on your taste preference. Types of potatoes include sweet potatoes, russet, Yukon gold, new potatoes, fingerling, red or purple potatoes. All types of potatoes provide complex carbohydrates in the form of starch and fiber. One serving of potato is about 3 oz. or one-fourth of a large potato. This serving provides 80 calories and 15 g of carbs in the form of starch. Carbohydrates should comprise about 45 to 65 percent of the total calories in your diet, reports the McKinley Health Center. Starch carbohydrates in potatoes provide 4 calories per gram, totaling 60 calories from carbohydrates. If you normally follow a 2,000-calorie diet, the amount listed on food nutrition labels, you need around 225 to 325 g of carbs throughout the day. Researchers at the Unit Laboratory for Innovation in Cereals in France published a study in "The Journal of Nutrition" in 2001 comparing benefits of high amylose corn starch and raw potato starch in rats. Researchers observed that either type of starch has similar benefits, including lowered triglycerides and total cholesterol, as well as enhancing your body's ability to absorb zinc, magnesium, calcium, iron and copper. Cholesterol benefits may occur because complex carbs in starch take an extended period of time for your body to break down, slowing the absorption of cholesterol into your bloodstream.